We custom build to your requirements if our standard models don't meet your needs. We'll respond quickly with specifications and prices. Consider these design features in your custom requirements: stainless steel crucibles, solid-state temperature controls and heated drain valves. Custom work is not an interruption, it's a normal part of our customer service. Ask for Steve Smith, our custom specialist. 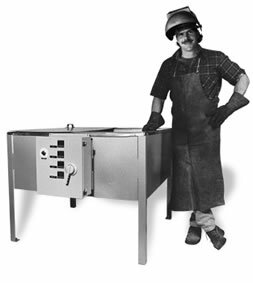 Our melting pots and tanks are constructed with a multiple-circuit, blanket-type heating element that is uniformly applied around the crucible. The result is totally uniform heat. No hot spots, cold spots or overheating. Temperature controls start the heating element for quick heat-up to maximize your production time. We offer precision heat control over temperature ranges of 150° to 1000° F. We also offer optional controls which can hold desired temperatures, some to ± 2°F. Hours of operation are Monday through Thursday 7 am to 3 pm and Friday 7 am to 2 pm, Central time.